I thought I would send you a quick email one week on from when we collected our snoodle Nancy. She has settled in really well and is so calm and loving. So far nothing has phased her and she is really adapting to family life well. Clearly you have done a great job of socialising her as she hasn’t shown any fear at all. I hope her brothers and sisters have all found homes too. 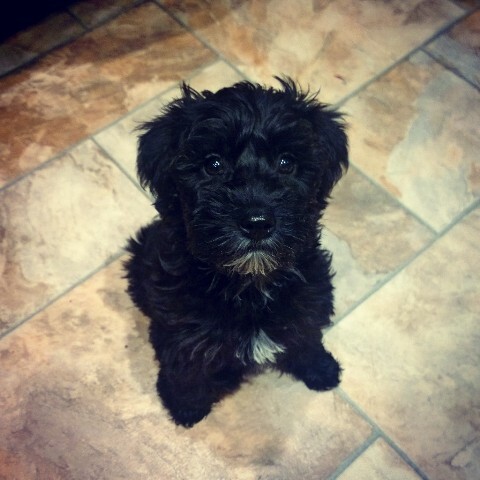 This entry was posted in Feedback, Miniature Schnauzer, Toy Poodle on January 26, 2015 by Tessa Marchand. Hi this is Seren one of your cavapoos. 2 years ago I left you to go home with my human Ruth so thought I would let you know what I have been up to. I settled really quickly in my new home and didn’t even whimper at night. As well as my human there are 2 cats in my family called Purdy and Tailor. 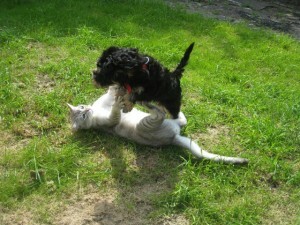 They took turns at puppy sitting but I had more fun when Tailor puppy sat as he was good for a romp. Purdy on the other hand always insisted that I lay down quietly and behaved myself. Very soon I realised that Ruth needed a bit more looking after than the average human so I set to work to make her life easier. I started by tidying up Purdy’s plastic food plate from the floor. I did accidently chew on it a bit but soon realised I needed to take her plate into the kitchen without decorating the edge with tooth marks. Sometimes those cats (usually Tailor) can be a bit naughty and knock things down so, as soon as I hear it, I run over, pick up whatever they have knocked down and take it to Ruth. Gradually I have learnt to pick up lots of different things. To begin with I wasn’t keen on the car keys as they made rather a noise when I picked them up but soon realised they were really important. Once Ruth threw a blanket down the stairs and it landed across the bottom 4 stairs. I haven’t had any training on this but I realised she was in trouble so pulled it down onto the floor. In my spare time I have become totally addicted to balllleeeeeeee J. There is nothing I enjoy more than charging after it to bring it back or leaping up to catch it in the air. And if we are at the beach it is even more fun. If Ruth is sitting down when she throws the ball I don’t have a care in the world. If though she is standing up woe betide any dog that tries to push her around – I won’t stand for that and tell them to back off – however big they are. I have also have fun doing flyball and adore the run backs. At 6kg though I don’t trigger the box yet. I am now starting a new chapter in my life as Ruth and I have been accepted by Dog A.I.D. for assistance dog training. If I work hard and learn everything my trainer teaches Ruth to do with me I can become a registered assistance dog. I already know how to behave myself beautifully when out in public and frequently get comments on my good behaviour and usefulness. Well that’s all for now. I will let you know how I get on with my assistance dog training. 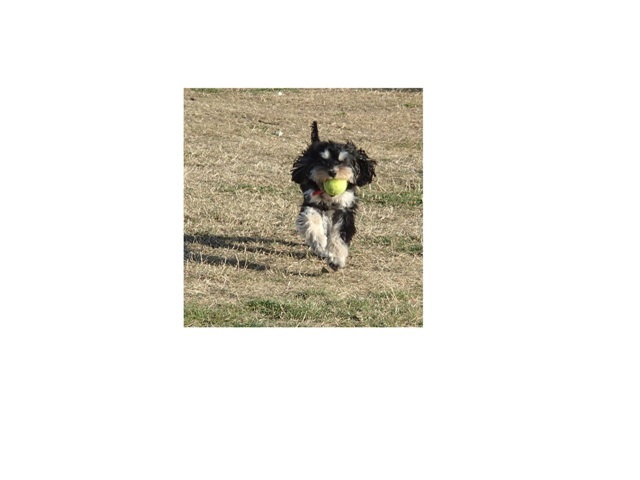 This entry was posted in Cavalier King Charles Spaniel, Feedback, Toy Poodle on August 21, 2014 by Tessa Marchand. Just a quick word about our adorable little Malshi puppy “Whiskey” that we bought from you February. He has brought so much joy to our lives already. He is so loved and everyone who meets him thinks he is so cute. We might have even got you an order for another from one of the people who met us in the street. 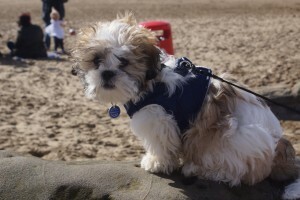 Attached a photo of him sat on the sea wall at Weston super Mare. Hope his litter siblings are as well loved as he is. This entry was posted in Feedback, malshi, Shih Tzu, Toy Poodle on April 2, 2014 by Tessa Marchand. Hi Tessa, our beautiful Ruby is now 7 months old and we couldn’t be happier with her! She is growing into such a sweet natured, cute little dog. She has settled in so well to our family that it is hard to remember a time without her. She recently one first prize in a local dog show for the best mixed breed dog, which we were thrilled about. We are thinking about training her to be a PAT (Pets As Therapy) dog when she is old enough as she is so easy going and has already made several visits to see the patients at the hospital where I work, which she took in her stride. Always happy to recommend your kennels……..thank you again! This entry was posted in Feedback, Shih Tzu, Toy Poodle on November 10, 2013 by Tessa Marchand.